The latest addition to Ferroli’s extensive range of commercial boilers offers unique design features that guarantee very high efficiencies, very long service life and superb performance. 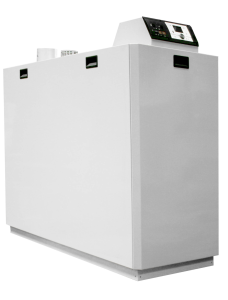 The floor standing gas fired New Condens FS 300-600 Series comes in 11 models ranging from 69kW to 542kW and can be cascaded up to a total capacity of 8,672kW. Specially developed for the New Condens are the robust Al-Si-Mg heat exchanger and the stainless steel woven mesh pre-mix burner which deliver efficiency levels of up to 109.5% (NCV). NOx emissions are as low as 22mg/kWh and a very high modulation turndown ratio of 1:7 provides high average seasonal boiler efficiencies. The easy to use controller and optional cascade module enable up to 16 New Condens boilers to be cascaded together and the controller allows the boiler to be fully integrated into renewable heating systems such as biomass, heat pumps and underfloor heating. All of the combustion components and heat exchanger sections are housed within a robust steel frame with easily removed panels. The New Condens is a superb example of Ferroli’s ability to design and build a boiler that is technically advanced whilst being easy to install, use and maintain. Visit the New Condens page to find links to the brochure and manuals.